In 1966 Aleksander Wat acquired a Grundig reel to reel tape recorder, then a relatively new household device. He kept it next to his bed, and often unable to sleep, recorded his thoughts in a whisper so as not to wake up his wife (who later transcribed the tapes). Hence these poems/musings are indeed fragments, at times rather rough, or overly speculative, but often brilliant and breathtakingly beautiful. Translated to English by Frank L. Vigoda. 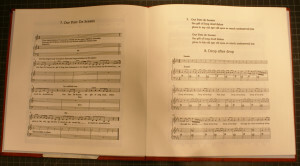 A dos a dos with Polish original and English translations on one side, sheet music of the songs on the other. Original music composed and performed on CD (included) by Ann Frenkel. 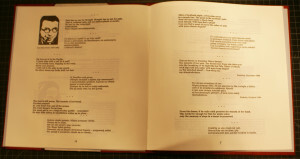 Letterpress printed and handbound in 35 copies. $ 180, shipping within the US included.